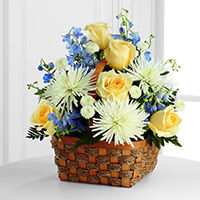 Provide comfort for the family of Joan Manzo with a meaningful gesture of sympathy. Millinocket and Wells – Joan R. Manzo, 73, passed away peacefully with family by her side on Tuesday, March 19, 2019. She was born September 4, 1945 in Millinocket, the daughter of Clinton and Minnie (Hutchins) Hartley. Joan grew up in Millinocket, and was a graduate of Stearns High School, class of 1963. She enjoyed working with crafts, spending time at camp, and travelling – alternating years between going on cruises and taking bus tours with her husband, Roger. Joan will be remembered as a loving and caring wife, mother, grandmother, sister, and aunt. She is survived by her husband 25 years, Roger Manzo of Millinocket; two children, Edward C. Thompson, and Joleen DeWitt and her husband Corey, all of Wells; a granddaughter, Michaela DeWitt of Wells; three step children, Tony Manzo of Orrington, David Manzo and his wife Jill of Hampden, and Carla Morrison of Westbrook; four grandchildren, Jordan Manzo, David Manzo, Anthony Morrison, and Cameron Morrison; siblings James Hartley, Marjorie Mason, Ronald Hartley and his wife Audrey, and Clint Hartley and his wife Madeline; two sisters in law, Kay Shea and Shelley Thompson; and several special nieces, nephews, and cousins. Joan will also be missed by her best friend, Louise Ware. In addition to her parents, Joan was predeceased by her first husband, Edward B. Thompson, a granddaughter Courtney Jo DeWitt, a sister in law, Lorraine Hartley, and a brother in law, Bruce Mason. The family would like to extend a special thank you to the staff at Katahdin Health Care for the thoughtful and loving care given to Joan and the courtesies extended to the family. Friends are invited to visit with the family 1-3 P.M. Friday, March 22 at the Lamson Funeral Home, 11 Tamarack Street, Millinocket, where funeral services will begin at 3 P.M., officiated by Rev. Herschel Hafford. Spring interment will be at the East Millinocket Cemetery. Gifts in memory of Joan may be sent to the Activities Fund at Katahdin Health Care, 22 Walnut Street, Millinocket, ME 04462. To plant a memorial tree in honor of Joan R. Manzo (Hartley Thompson), please visit our Heartfelt Sympathies Store. Interment will be in the spring time. Eddie, Joleen and Family: We used to visit with your Mom and Dad when we used to travel to Bangor to take our son Alton to the Doctors. They would do anything for us and appreciate all that they did for us. Watching you Eddie and Joleen grow up. Our sympathy to you and your family in the loss of your Mother. Love and prayers , Gladys and Gene Berube, Limestone, ME. Aunt Joan was fun. Full of kindness and caring and laughter. So many happy memories. She was a Big person in a small package. I will miss her greatly. - Sadness and love from the Hartley family of Wisconsin. Kathy and Paul Manzo purchased the The FTD Heavenly Scented Basket for the family of Joan Manzo. To the family, I express my deepest condolences for the loss of your love one. In the Bible, God expresses death as a "sting." (1 Corinthians 15:55,56) So this means that behind death, there is a painful hurt. He also knows what it is like to experience losing a love one as "he did not spare his own son but handed him over for us all." (Romans 8:32) But soon God will do something amazing. "All those in the memorial tombs will hear his voice and come out." (John 5:28,29) God will use his Son to bring back all our dead loved ones to life! What a joy that will be! There, God "will wipe out every tear from (our) eyes and death will be no more neither mourning nor outcry nor pain be anymore." Again, sorry for your loss.